I usually have no problem putting my own foot in my mouth, but my phone has been helping me out a lot lately. Bless its heart though, the poor thing isn’t completely bilingual yet either. It has not adapted its predictive text to French yet. Consequently, I have sent a few doozies lately. 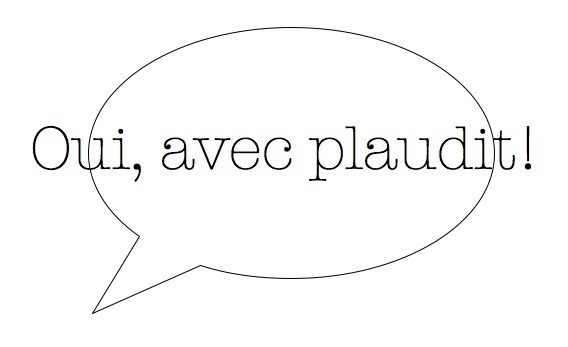 When a friend texted proposing to get a coffee, intending to reply “oui, avec plaisir” (aka “I’d love to!”), my phone responded with “oui, avec plaudit”. No, we did not plan a rendezvous, but rather a rigoletto. Comment-allez vous? Comment-allez voucher. Fortunately, my phone has a thing for the opera; he will do just fine here. Posted in Illustration, UncategorizedTagged bilingual, c'est ma vie, cultural misunderstandings, France, humor, humour, life in france, mobile phones, predictive texting, predictive texting gone wrong, Why me?